Bauer students from the Wolff Center for Entrepreneurship will take over Butler Plaza for three days during the annual Wolffest competition April 16-18. Things will heat up next week for students from the Cyvia and Melvyn Wolff Center for Entrepreneurship at the C. T. Bauer College of Business. During a three-day battle of the pop-up businesses, they will soon discover if their entrepreneurship acumen can handle the heat. On April 16-18, WCE will hold Wolffest on campus in Butler Plaza, in front of M.D. Anderson Library. The annual event is part of the program’s capstone course and the final steps for students in completing a BBA in Entrepreneurship from Bauer College. A contest of creativity, business aptitude and teamwork, the event requires entrepreneurship student teams to launch pop-up restaurant stands and compete to see who can earn the most revenue and execute their plans best. Students also learn how to work in teams, how to keep “employees” motivated and experience the challenges of raising money to start up their business, she added. 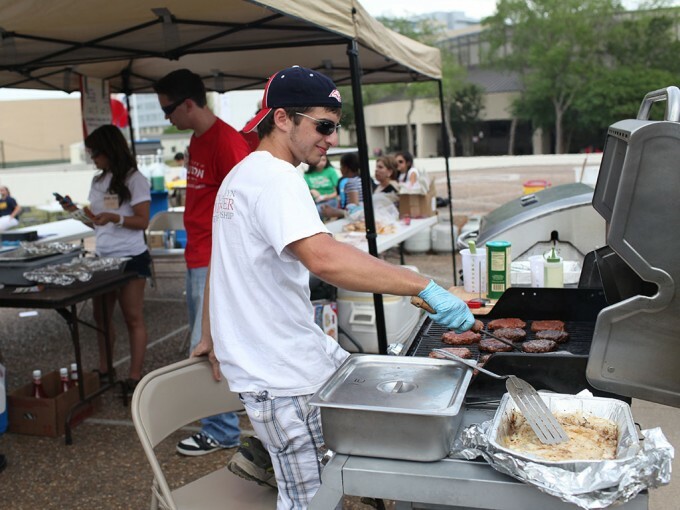 Although the event is centered mostly on the concept of food and serving hungry customers, the students aim to serve a bigger purpose. “Wolffest is a celebration of entrepreneurship, and I believe that it is imperative for UH students to attend the event because it exposes them to an innovative environment filled with passionate, hardworking, driven individuals looking to change the world,” entrepreneurship/finance senior Adam Cooper said. “As a UH Cougar and a member of the Wolff Center for Entrepreneurship, I believe that it is our job to promote an entrepreneurial mindset throughout campus and to have the rest of the student body begin to think in a way that allows them to think creatively, strategically and passionately as well,” he said.